I live in the South, and there are several farms in this area. Recently, I heard a story about a farmer that made me wonder. The characters in the story are: the farmer, some cows, a donkey, and a nameless predator. Okay, I will name the predator in the next paragraph. A coyote. That's what the predator was. Now, that we have established the characters, I shall tell the story. The farmer was having serious problems with his cows. No, it's not what you are thinking. There were no local teenagers sneaking onto the farm to tip over the cows. Nah! Instead, something was coming to his farm at night and was attacking his cows. As he later found out, it was a coyote. Or two. I was not there, so I can't tell you. But there was at least one coyote involved. Anyway, the cow-coyote saga continued until one day, when the farmer introduced the cows to a new friend: a donkey. After exchanging e-mail addresses and phone numbers with each other, they all went to sleep. I think. Well, to cut the long story short, the coyote problem was solved after the donkey joined the family. Why? Well, here is the explanation. Moral of the story: Make friends with donkeys if you have a coyote problem. Moral of the story: seek help/make friends with those who would help you grow. Lara: Happy New Year. Thank you for reading between the lines. I love the suspense. You are such a great writer. Miss Lara really broke it down and I got the message as well. 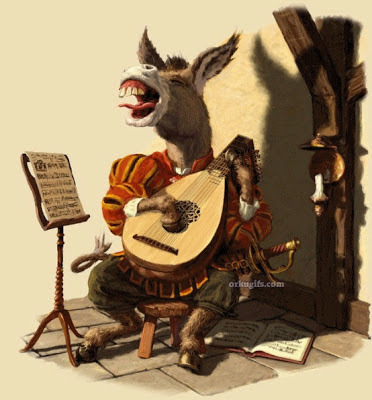 LOL @ the singing donkey!! reminds me of the talking donkey in shrek.